By discoursing on a movie such as 12 Angry Men, I would be, to some extent, stealing from a prospective viewer that pleasure which I experienced while watching this breakthrough movie: that is, the pleasure of not knowing what a movie is about and being completely surprised while watching it. If, as a viewer, this element of surprise is very important to your experience of the movie, I would suggest that you read no further. 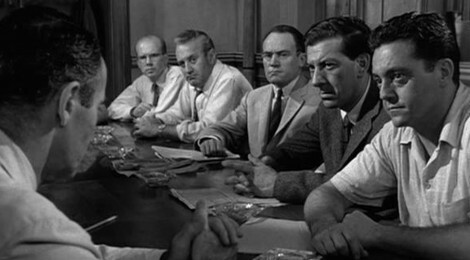 Reginald Rose’s tele-play 12 Angry Men was adapted for the screen and presented to the American audience in 1957. The movie has become an important learning material for scriptwriting classes, film institutes, business schools and most importantly, for law schools around the world. Of course, purists may comment on the aspect of the facts which were misrepresented. Yet, for a person like me, who watches a movie expecting it to be nothing more than a thought-provoking and enticing experience, this movie was a definite treat and its “misrepresentation of facts” only an instance of cinematic liberty. The plot revolves around the fate of an eighteen year old lad, which lies in the hands of 12 jurors. Like the posters of this movie screamed, “Life is in their hands– Death is on their minds.” The boy is on trial for supposedly killing his father in what, at the inception of the movie, seems to be an open-and-shut case. The jury, as the judge reminds them, must come up with a unanimous verdict of “guilty” or “not guilty”. If the jury decides that the boy is indeed guilty as charged, the judge would have no choice but to sentence the boy to death. The jurors are all set to arrive at a decision as soon as they could and to be on their way to lead each of their private lives. However, things were not to be so. One of the jurors seems to have a reasonable doubt about the boy’s guilt and he would like to “talk” about it before the defendant is sent to his fate. Anger, as suggested in the title of the movie, is only one among the different emotions that ensue in the jury room during the next couple of hours. The setting of the movie, except for the opening and closing scenes, is entirely in the jury room. Some of the jurors are also briefly seen in the toilet attached to the jury room. The jury room came without air-conditioning and the wall fan does not seem to be working. Opening the windows does not help either in releasing the heat occupying the room. While the mounting temperature in the room is metaphoric with the temperament of the jurors, it also lends an exponential effect to the tension in the room. This claustrophobic setting of the movie is one of the techniques the scriptwriter uses to enforce the dramatic effect of the movie. The viewer wouldn’t be surprised to find himself sweating throughout the duration of the movie. The jurors sitting around the table in order of their numbers come from different backgrounds. None of the names come up during the entire process of deliberation. Only two names are exchanged, when Juror No. 8 and Juror No. 9 say good-bye at the end of the movie. Critics often complain that no women or African-Americans were part of the jury in this movie. I couldn’t help wonder how the title of the movie would have worked out in case there were a woman or women in the jury. In all other respects, the jury had a good mix of people from various sections of the society. A stock broker, a self-made businessman, an advertising executive, a football coach, a painter, a garage owner, a mechanic who grew up in the slums, an immigrant watchmaker, a bank clerk, a salesman, a retired old man and an architect formed the jury. Juror No. 8, played by Henry Fonda, is the first person to form some reasonable doubt from the proceedings in the court. Until the time a vote was called, the room is seen in unanimity. The jurors, as they discuss the case, have more or less made up their mind. They are seemingly calm and a reasonable set of people. With No. 8’s vote of “not guilty”, the whole room is engulfed in anger and excitement. The psychology of how a jury would actually behave records that when 11 jurors are voting for a certain decision, the 12th juror would also bend in to pressure and vote for the same decision. This is one of the reasons why legal professionals argue that in an actual jury room, the jurors would have sent the young boy to his death sentence. Juror No. 8 is a man of conscience. He cannot send a boy to his death without even discussing the case once. He has a reasonable doubt in his mind and that is enough reason for a juror to vote “not guilty”. His gentle effort in convincing the other jurors of his doubt in the rest of the movie despite their varying temperaments form lessons in reasoning, consensus building, teamwork, leadership and above all, tolerance. The movie’s greatest message even for today’s times is its reference to the aspect of reasonable doubt. In a criminal trial, the defendant is considered innocent until proven guilty beyond reasonable doubt. In the United States, the decision of guilty/not guilty lies with the jury while in a nation like India, the decision lies with the judge presiding over the case. Regardless of where the trial is held, all judicial systems warrant that the judgment eventually must hold beyond reasonable doubt. Some might perceive this subject to be difficult to understand. In the movie, sometime after halfway through its duration, some of the facts raised during the trial have already been proven invalid. At this point, Juror No. 5 confronts Juror No. 7, who is restless to get to a baseball game happening the same evening. Juror No. 5 – You still don’t think there is any room for reasonable doubt? Juror No. 7 – No, I don’t. Juror No. 11 – Pardon. Maybe, you don’t fully understand the term, “reasonable doubt”. Towards the end, Juror No. 8 brings up the aspect of reasonable doubt again. 12 Angry Men is a scriptwriter’s dream work: a script that is taut and brilliant throughout the 96 minutes of its running duration. There are no excesses and every scene has some insight, either into the deliberation of the jury or into the persona of each juror. The script does not leave out any juror. Every juror gets to speak and everyone of them comes with their individuality. During the first half of the movie, the script depicts Juror No. 8’s initial calm temperament in his leading the other jurors through a number of suppositions. However, it is clear that not everyone actually sees light in his argument, for example, when Juror No. 6 talks to him in the toilet. Juror No. 6 – You think he is innocent? Juror No. 8 – I don’t know. It’s possible. Juror No. 6 – I don’t know you, but I’m bettin’ you’ve never been wronger in your life. Y’oughta wrap it up. You’re wastin’ your time. Juror No. 8 – Suppose you were the one on trial? Juror No. 6 – I’m not used to supposing. I’m just a working man. My boss does the supposing. But I’ll try one. Suppose you talk us all outta this and the kid really did knife his father? The film was as much Sidney Lumet’s as it was Reginald Rose’s. Lumet, in his debut as director for a feature film, brings a great deal of depth to the viewing experience of the movie. One of the aspects in which he, along with cameraman Boris Kaufman, tries to do so is by closing the size of the room as the movie progresses. When the movie begins, the room is shown in its entirety and the jurors are shown through wide-angle lenses. As the tension mounts, the scenes close in on each juror to such an extent that the entire screen would be filled with the face of the arguing juror in certain scenes towards the end. Of specific note in this respect, were the shots involving Juror No. 9, the old retired man. He brings up some of the most important breakthroughs in the argument for “not guilty”, including his vote of support to Juror No. 8, when the man “gambled for support and I [Juror No. 9] gave it to him”. Every time this juror would make an important statement, the camera would capture the old man closely from the chin up. The excitement caused by this effect, surpasses any explanation. One can feel one’s heart pound as Lumet takes us through the close-up shots. Of particular focus in such scenes is the perspiration on each juror’s face, which is in line not only with the rising temperature in the room, but also is an indication of the tension in the room. 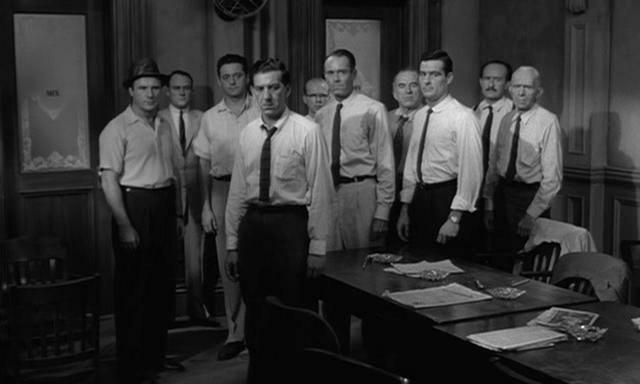 12 Angry Men received a lot of the acclaim much after the movie came out. It was not a success at the box office. In all three categories that it was nominated, 12 Angry Men did not win a single Academy Award. Yet, over the years, the movie has consistently found its name in various lists considering it among the best movies ever made. Law schools run it as an example of how the jury runs. Management advisors talk about it as a lesson in consensus building and reasoning, while working with diverse teams. Film institutes have in it a case study for scripting movies that are less expensive to make. Without special effects, without melodrama, without any action sequences and without a big budget to back it, this black-and-white movie did for me what many contemporary blockbuster movies fail to do: it had me riveted to the seat and sweating. Now and then, I would still go back to the movie to find something new in it. Regardless of what one may discover or not, one would always have a relevant lesson to take home from this movie.